Soredemo Machi wa Mawatteiru Episode 6: …Derp. 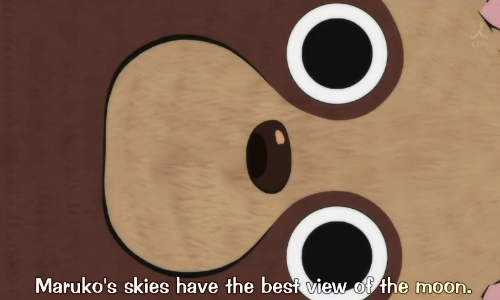 Well then, if it wasn’t for the racoon-bear-dog popping up every now and then, this show would definitely be out of my list already. Summary: Arashiyama FAILED. End of episode. Impression: Ok, how long is this going to go for? It’s the exact same thing happening every single episode: Arashiyama fails, Tatsuno likes Sanada and their relationship stays completely dull, the jokes are lame and only some funny ones pop up once in a while and the art is horrible. I really don’t know how to review this anymore, considering NOTHING HAPPENS. This time they make a big deal out of a box that has nothing interesting in it, and then Tatsuno and Arashiyama work on a website and fail. There’s no plot AT ALL. Tagged Currently Covering, episode 6, review, soredemo machi wa mawatteiru. Bookmark the permalink.